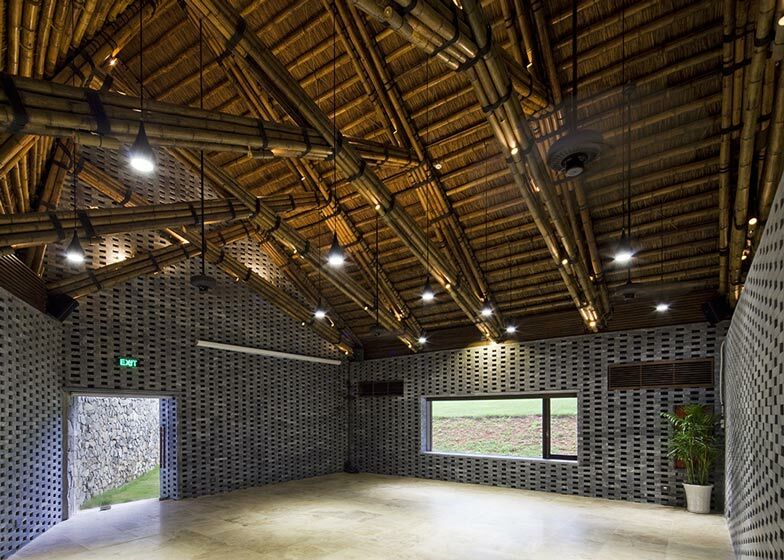 Vietnamese studio Vo Trong Nghia Architects has hidden a bamboo-framed conference centre behind a fortified stone wall in the countryside outside Hanoi (+ slideshow). 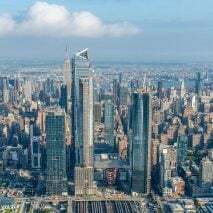 The 80-metre-long wall may look like a historic structure, but the architects actually constructed it as part of the project. 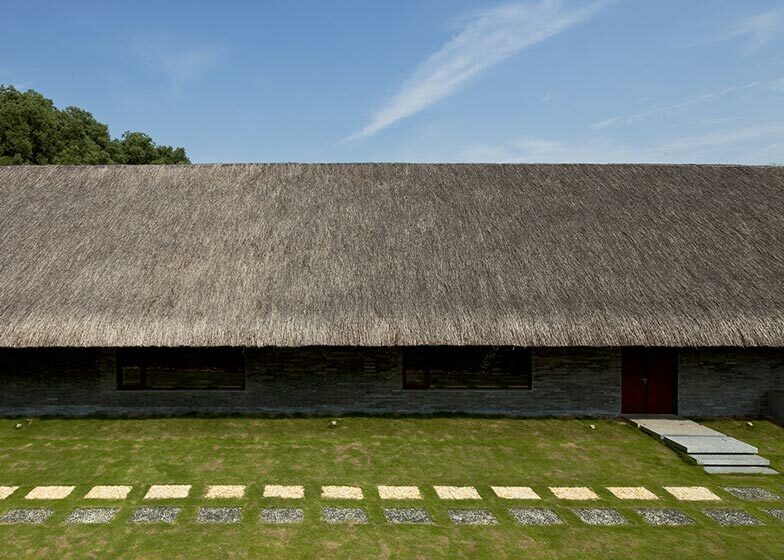 "In north Vietnam, there is a tradition to make rustic stone walls," Vo Trong Nghia told Dezeen. "I wanted to make the wall become a part of the beautiful landscape." 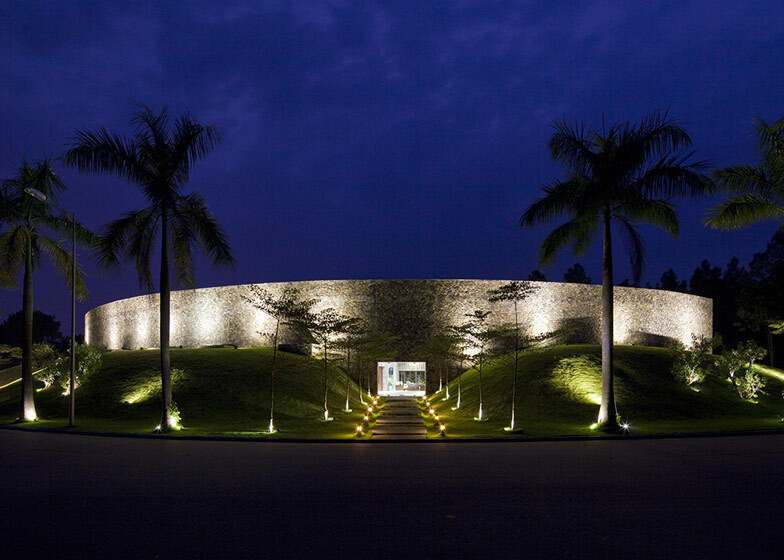 Built using dry stone, the wall curves gently around the edge of the building, shielding the interior from the road and protecting it from the noise of a restaurant across the street. 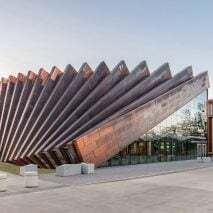 "I wanted to design a quiet space for the new conference hall," said the architect. New earth mounds rise up around the edges of the wall but a tunnel-like entrance leads inside, where a reception lobby directs visitors into the largest of two conference halls. 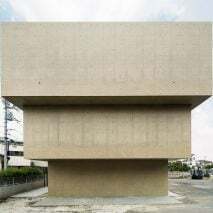 Once inside, the bamboo framework is revealed as a row of trusses that follow the curve of the facade to supporting the asymmetric roof above. 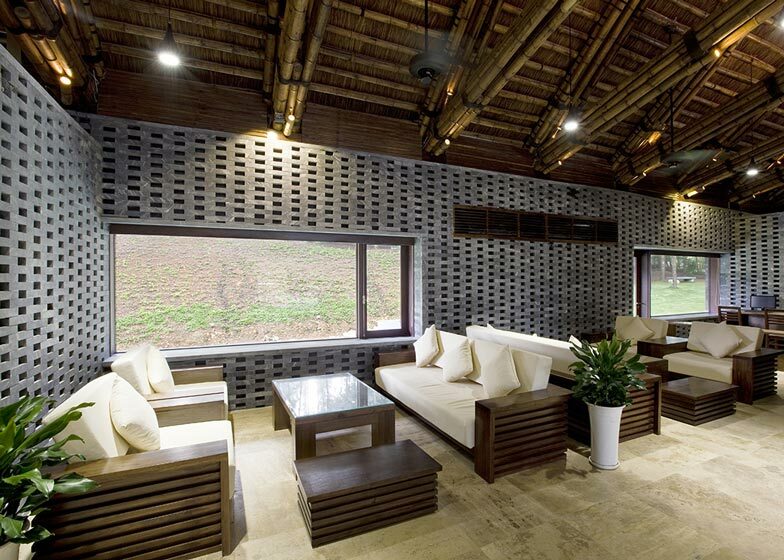 The architects deliberately specified locally sourced bamboo for the structure. "In southern Vietnam, we often use 'Tam Vong' bamboo, which is bendable and suitable to create a curving figure, but this is not very available in north Vietnam, so we used 'Luong' bamboo, which is more common," Nghia explained. 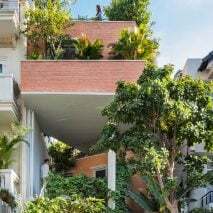 Describing the difficulties the architects encountered with this material, he added: "This bamboo has a big diameter and is difficult to bend. Our challenge was to create a pliable form by using this hard and straight bamboo. 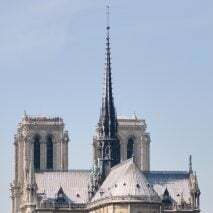 So the frames of the roof had to change their shape gradually." 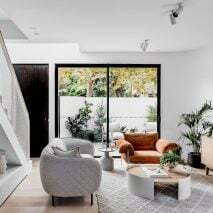 Grey brick walls line the interior and while pendant lights hang down from the ceiling to sit level with the eaves. 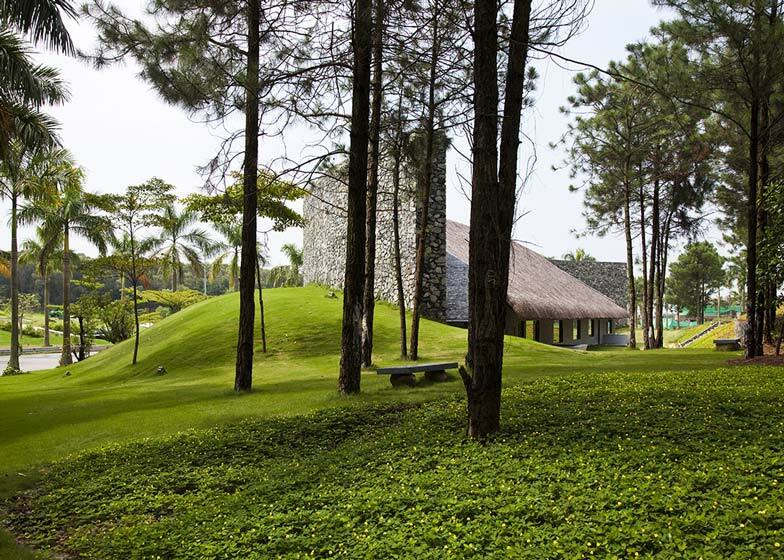 The Dailai Conference Hall forms part of the Flamingo Dailai resort, a holiday retreat surrounded by woodland at the foot of the Tam Dao Mountain in northern Vietnam. Vo Trong Nghia Architects frequently use bamboo for their buildings and recently came up with a concept for low-cost modular homes built using the material. 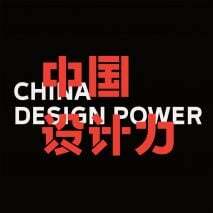 The architects also picked up two awards at the 2012 World Architecture Festival, where we interviewed Vo Trong Nghia about his plans to reduce the energy crisis in both residential and public buildings. 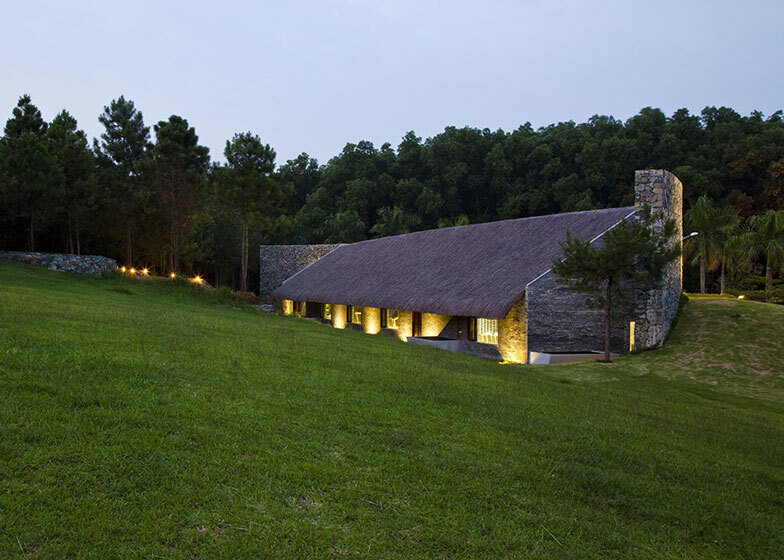 See all our stories about Vo Trong Nghia Architects. 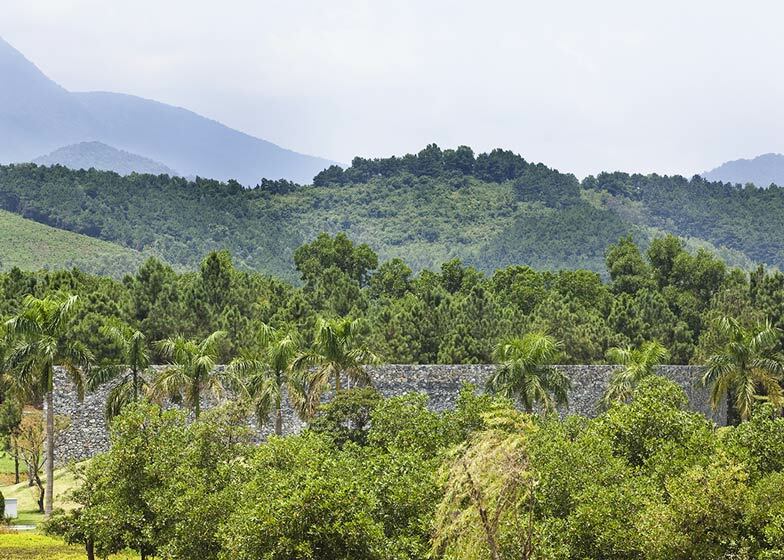 A residential resort, named Flamingo Dailai Resort, was planned and partly constructed for busy city citizens to enjoy their weekends surrounded by nature. It is located in the middle of flourishing forests between Dailai Lake and surrounding mountains, about 50 km away from Hanoi. The guests of this resort can enjoy the beautiful landscape inlayed with numerous natural objects, plants and flowers and escape from their daily life in cramped quarters. 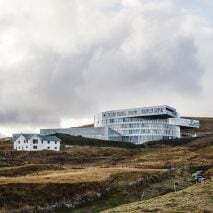 The lot of Dailai Conference Hall is located beside the main access road, which is used as an entrance for the whole resort; the building welcomes all visitors when they come. 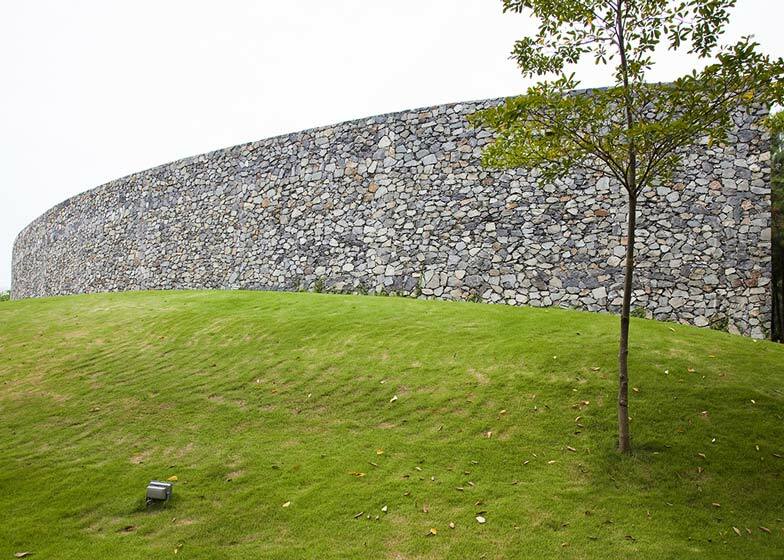 To enhance their expectation for a delightful stay in the resort, an impressive curved stone wall along the road was designed as its “receptionist”. 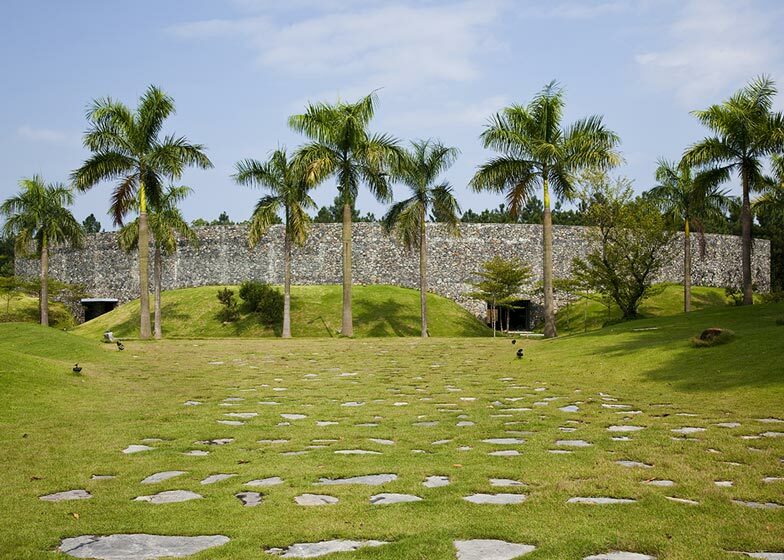 The wall, which is 80-meters long, 8-meters high and 1-meter thick, offers a sequential view to visitors, revealing and screening the surrounding nature from place to place. 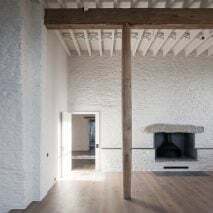 Furthermore, the curved wall works as a device, which raises the morale of visitors and attempts to lure them to events being performed in the hall. 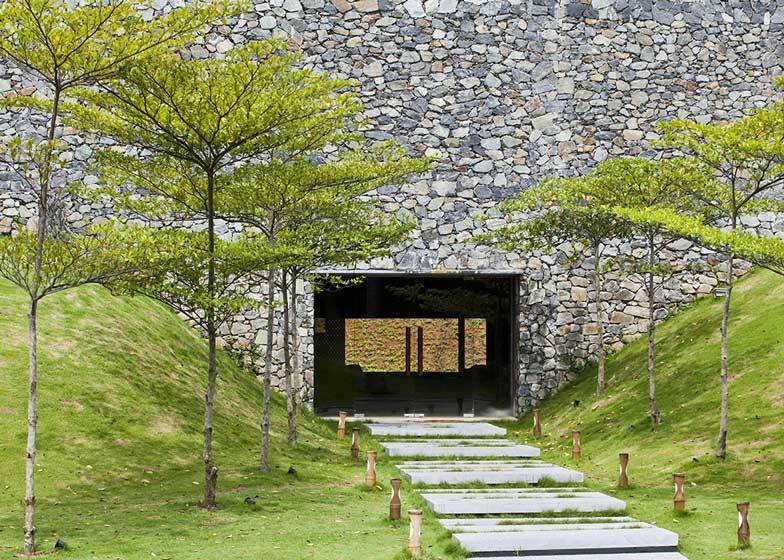 An orthogonal access between artificial hills conducts visitors through the stone wall, then, visitors reach a foyer covered by a dynamic bamboo structure with an extraordinary scale. 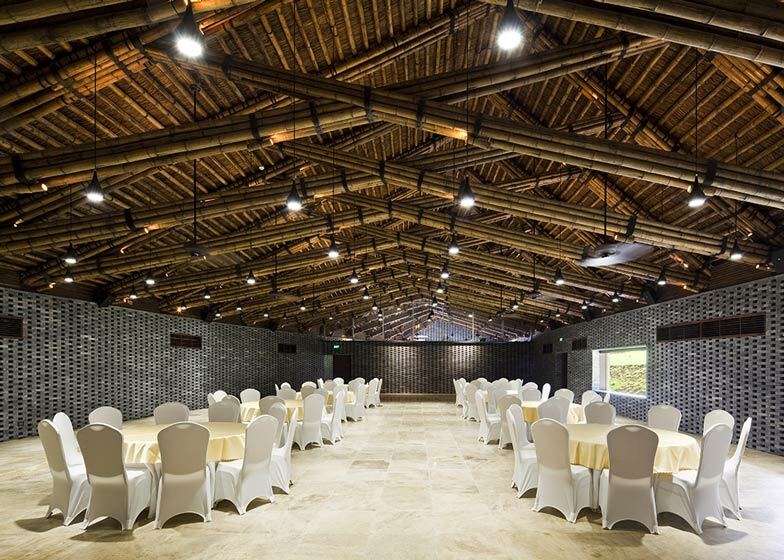 The wide-span structure of the conference hall consists of the composition of straight bamboos. 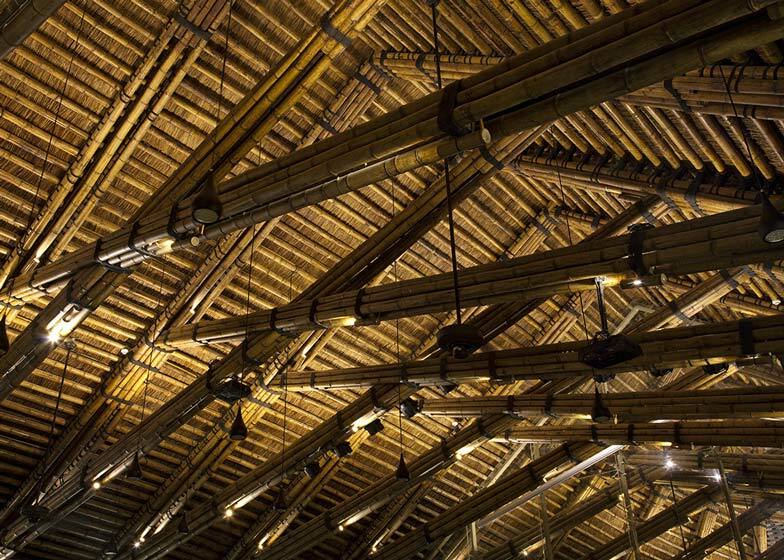 Bamboo itself has many advantages, such as beautiful color, texture and reproduction potential. Many bamboos are assembled into a structural frame, which has higher reliability and redundancy than bamboo used individually. 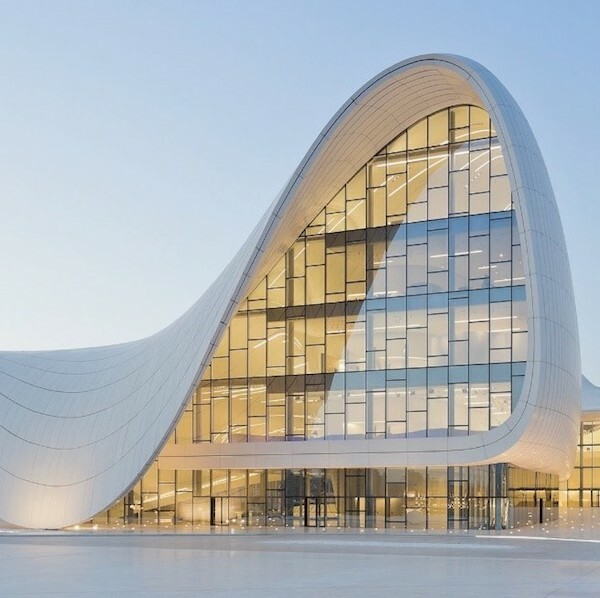 Its maximum span is 13.6 meters and the positions of the joints at each frame are adjusted to make a generous curve of the roof. 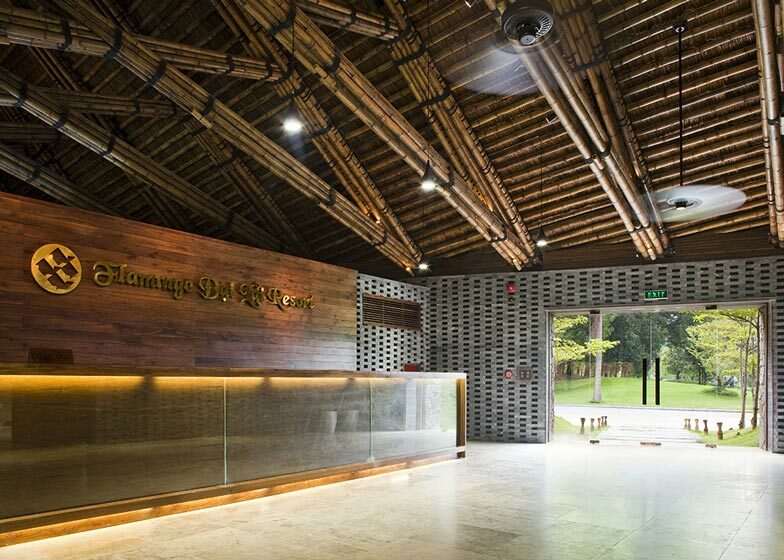 Though the functional requirements as a conference center divide the space into specific rooms such as a main hall, sub hall, foyer and supporting rooms, the dynamic bamboo structure enables visitors to feel the spaces are wider and more open, showing its continuity through a transom window above the partitions. Bamboo and stone are abundant natural resources near the area. 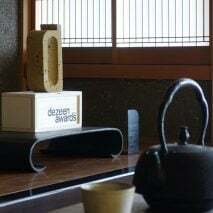 The hall achieves its originality and special atmosphere by using these local materials in plenty. 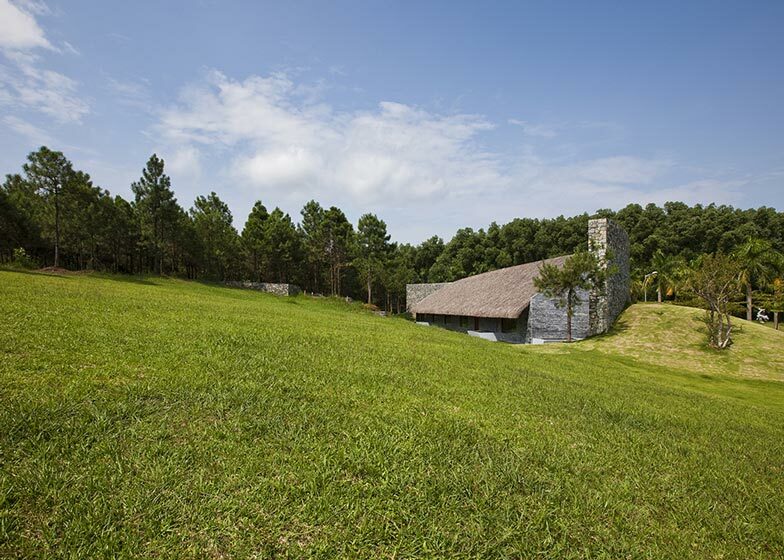 Consequently, the building becomes a friendly accompaniment to nature. 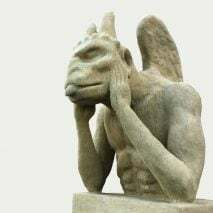 The aim of this building is not only to supply a nice space for events but also to deepen the experience of the generous spirit of nature.